In a recent study, the interaction of various methylaluminoxane (MAO) models on the (110) MgCl2 surface were studied with dispersion corrected DFT (revPBE-D3) in ADF. MAO activates the metallocene catalyst, but the structure(s) of MAO are unknown and depend on the reaction conditions (see also this highlight). The use of a support affects the equilibrium between species that could potentially be active in polymerization and those that are dormant. The work was carried out to get a better understanding of how the support lowers the Al:catalyst ratio necessary for good polymer activities. As the calculations in this paper show, the active state of MAO is stabilized by the (110) MgCl2 surface. 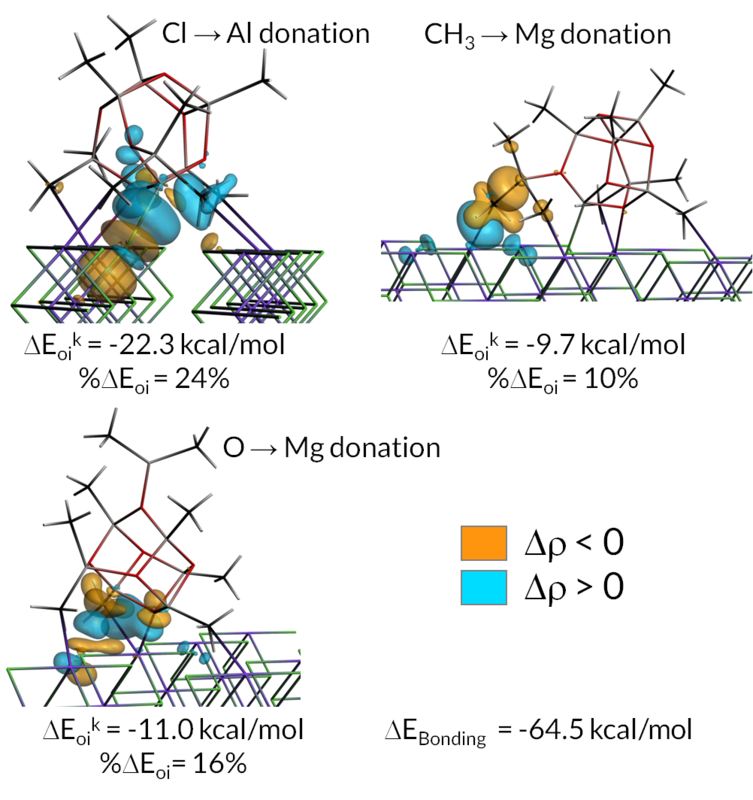 An ETS-NOCV analyses revealed that the active MAO species interacted with the surface via surface to adsorbate donation (Cl to Al) as well as via sizable interactions involving charge donation to the surface Mg atoms from MAO methyl groups or O atoms. Insight in the bonding interactions of the surface, the catalyst and co-catalyst can help to understand the complexities of the heterogeneously catalyzed olefin polymerization reaction.